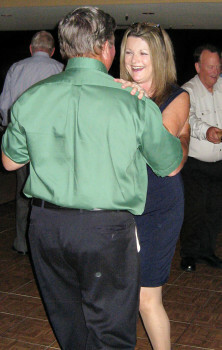 Basic Social Dance is so much different than Ballroom dancing. It’s “lead and follow.” You, your partner and the music are the top priorities. Let the music tell you what to do. The limited space on the dance floor and the wide range of music provided at social events requires more than memorizing a series of patterns in a specific dance. Don’t want to look like Fred Astaire and Ginger Rogers? Just don’t want to look like Abbott and Costello? Try Basic Social Dance and be the life of the party! Our fearless leaders will lead; our lovely ladies will follow and, as a team, they will be dancing to any song of any genre of music in just a few hours. Walk in – dance out! No kidding! Mary Lou Kaye, your trained and certified master instructor invites you to amaze yourself. The next session of classes begin the first week in March. Call 480-939-1869 for details and to register.